Add the milk followed by the crushed pineapple. Stir continuously and keep mixing well on low to medium heat for about 15-20 minutes. Add the almonds, sugar & cardamom powder and continue to cook for another 2 -3 minutes. P.S.- I am really not sure whether this is a halwa or a sheera or a kesari. I’m pretty sure that there is some subtle difference. If any one of you knows the difference, do let me know. Update: I have decided to send this to Latha as my entry for participating in her Krishna Janmashtami celebrations. Looks awesome! My hubby loves this and I have a can of pineapple stiing inthe pantry... thanx for the wake up call! looks delicious! 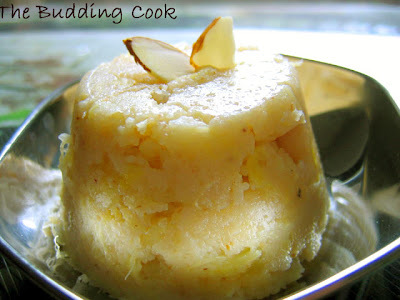 rava is so very versatile, makes sweet n savory yum dishes. btw, when i make halwa, rava absorbs milk within 2 minutes, so i'm guessing u keep it for 15-20 mins just to cook the pineapple? Wow! Looks like my kind of dessert. I'm going to make this tonight. Thanks. it's beautiful, and low fat to boot. Anything with pineapple has a special place in my heart! So, you are not draining the pineapple right? Pineapple halwa is yummy. Isn't it? I too have posted this recipe recently. My version doesn't use milk though. If I am correct, South Indians (especially Kannadigas) call the sooji halwa as kesari bhath because they add orange or kesari color to it. Andhrites call it kesari or halwa. I have seen Maharashtrians calling the same sooji halwa (without the color)as sheera. Whatever it is, rava and pineapple is an amazing combo. Think a halwa has to be shapeless and smothered in ghee! Your creation looks wonderful! Richa,yes.. it was to cook the pineapple & also to let some of the liquid evaporate & let the whole thing sorta "come together"
TC, do let me know how it turns out. Sirisha, try it when you can & let me know how it turns out. Patricia, I love pineapple too... fresh ones are the best but I was too lazy to do all that work. Laavanya, it tasted very good.Actually, eating it while still warm is the best. I did drain the crushed pineapple before using it but there was still some of the juice going into the halwa. Suma,yes it was & I did't even feel guilty after eating it:-).So then this is a halwa, right?. I will check your version of this too. Is that so? yeah, the ghee bit does make sense.I tried googling it but did not have much luck. I usually like my cream of wheat porridge with pineapple jam so I can imagine how wonderful this tastes. Looks good, TBC. Looks very easy to prepare, will try this, my kids love pineapple dishes. You just gave me another recipe to try out!:-)Thanks. I'm still not sure wot to call it! Seena, do try it when you can. Love the delicate color of this dessert! And it looks so quick and simple. Nupur,thanks! Yes, it was,didn't take too long at all. Holy cow. This is simple and delicious! I love the look of it! I'm bookmarking this! You can give a new name to this recipe dear! Looks great! I think i'm gona call it pineapple kesari:) b'coz this looks like what i had by that name at a south indian restaurant, and I loved it...I'm a huge fan of sweets, so can't wait to make this one!! Lovely entry dear! I am planning the round up on 12th september. Latha, thanks a lot! :-). I cannot wait to see all the entries! Apple, thank you very much.Hope to see you around here often. Pretty simple version you have here. Like the picture too. Hi, This is a great recipe. Im definitely going to try it out soon. Just a headsup. Came across another recipe for the pineapple suji halwa online that is using the same picture as yours.. Heres the link incase you would like to check it out. Habiba- Thank you so much for letting me know! The picture there is mine and it has being used without my permission- thanks again for leaving a comment here to inform me about it. P.S. I'm unable to access your profile and get in touch with you any other way to express my gratitude for alerting me.